American Alligator; photo © Louisiana artist Guy Fanguy (all rights reserved; used by permission). Florida also recognizes another reptile as a state symbol; the gopher tortoise. Alligator comes from the Spanish "el lagarto" (the lizard). The American alligator (Alligator mississippiensis) is native to the Southeastern United States. American Alligators construct burrows, or "alligator holes" for shelter and hibernation and play an important role in their ecosystem - they control the populations of prey species, create peat through their nesting activities, and benefit several other species with 'alligator holes' and nests (including the Florida Red-bellied turtle, which incubates its own eggs there). 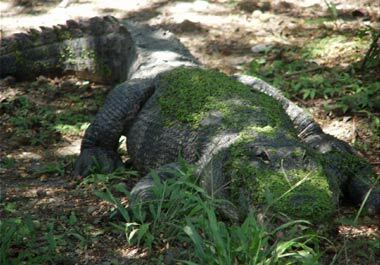 After surviving nearly unchanged since the time of the dinosaurs, and having virtually no natural predators as adults today, alligators were headed for extinction due to intense hunting from man and were listed on the Endangered Species Act of 1973. 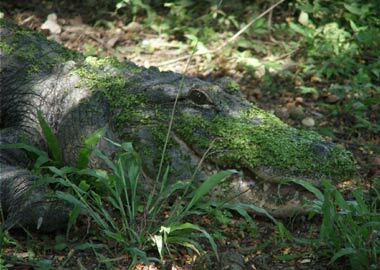 Protecting the species and alligator habitats allowed the status to be changed from endangered to threatened in 1987. A typical male reaches 13-14 feet in length and can weigh over 600 pounds (there are unconfirmed reports of alligators over 16 feet). Immature alligators have yellow cross-bands on a black background for camouflage. Adults can be long and thin or short and stocky.